Some school committee members say the proposed changes are too extreme. 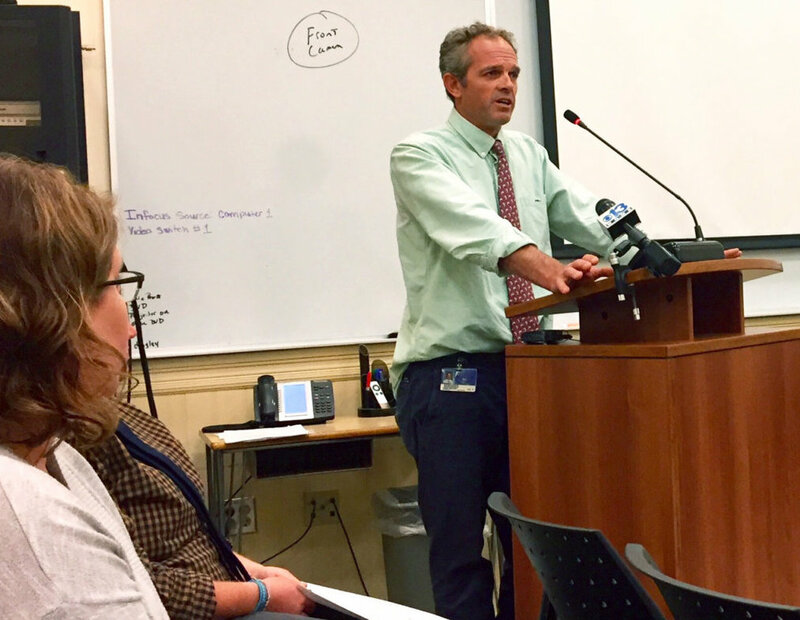 LEWISTON — Superintendent Bill Webster on Monday proposed sweeping changes to the School Department’s field trip policy, which some School Committee members said go too far. The changes are in response to the death 13-year-old Rayan Issa, a Lewiston Middle School student who drowned during a school outing at Range Pond State Park in Poland on June 12. He was retrieving a football in water over his head. A report by the Lewiston School Department’s lawyer, Daniel Stockfield, concluded neither adults nor the lifeguard saw the boy in distress. • No more swimming or boating activities, unless an outside group with water safety expertise ensures safety, including the YMCA, the YWCA, Bates College, the University of Maine 4-H Camp and Learning Center in Bryant Pond, the Chewonki Foundation, Camp Kieve and L.L.Bean. If water safety experts do not go on field trips, students could only go into the water up to their ankles, and only if a lifeguard is on duty and there is one authorized adult for every six students. • A meeting would be held at the beginning of field trips to go over safety rules with students and implement a buddy system. • Field trip permission slips would have far greater detail of risks in the outing and would be in the language of the student’s family. • Water park trips would be prohibited. Some committee members said Webster’s proposals go too far. Walker, who is licensed by the Coast Guard to operate and carry passengers on his boat, said there are billions of dollars of revenue that come from those natural resources. “Don’t throw a blanket over (this) saying we’re going to prohibit water. I’ve brought many students out on the water from Lewiston High School. I’m hoping to bring many more.” His top concern is safety, he said. Walker agreed that more precautions are needed. He cautioned that the list of water safety experts was too small, that Maine registered guides can safely bring students and teachers on expeditions. When writing new policy, “make sure you’re thinking of small companies too,” he said. School Committee member Tanya Estabrook said she liked what Walker had to say, and suggested he be involved in policy revisions. The committee will look at field trip proposals at its meetings in late September or October.